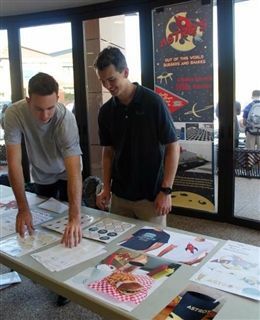 On February 10th, students were treated to a campus burger barbecue hosted by the Advanced Topics in Design class. The cookout celebrated the class's recent project for which students created burger restaurants, from concepts and logos, to images of "real" meals and architectural sketch-ups. 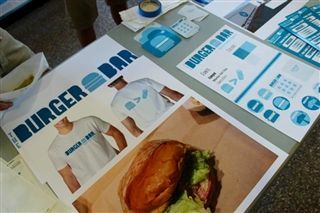 This year's concepts included Astro's, a retro, space-themed burger joint and Burger Bar, a laid-back beach eatery. Faculty members flipped burgers while students chowed down and perused the designs, voting on their favorite. Nearly 180 ballots were cast, and in the end, it was winner Astro's and its promise of "Out of This World Burgers and Shakes" that left students hungry for more.